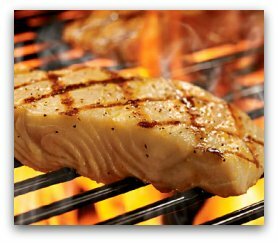 Grilling fish is an excellent cooking technique for fillets, steaks, and whole fish of the more oily fish such as salmon, trout, striped bass, and even less oily fish such as cod. It is similar to broiling, except that the heat comes from underneath, rather than from above. And a lot of the fish recipes can be easily used for both methods. Delicate fish such as catfish fillets can be used as well. However, they tend to break apart and fall through the grill. So it's best to use to use a small-grid grill basket or aluminum foil with some holes punctured in it to allow air flow. Both methods rely on the intense radiated heat to cook the food quickly and give a nicely browned appearance. The grill itself gives the food the characteristic grill marks as it transfers heat to it. The outer parts of the fish are nicely seared while the meat on the inside will remain moist and tender. 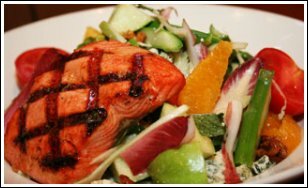 Grilled Salmon topped over a bed of fresh chunky vegetables and fruit salad. It's good to know your grill to be successful at grilling fish. The barbecue has been the mans' domain for many years. However, more and more women are becoming experts with the backyard barbecue. And rightfully so. But, it still can be a little tricky when cooking fish, especially using dry heat methods. The design of the grill and the fuel source all play in the factors of grilling fish. It can be electric, gas, charcoal, or wood, which will determine the intensity of heat at the surface of the grill. And of course, the heat determines how long it will take to cook the fish, and how much of the smokey flavor will be infused in it. A stove top grill or a grill pan is also excellent to use, such as the Nordic Ware Cast Grill N' Sear Oven Pan . The grilling surface should have bars spaced no wider than 3/4 of an inch apart. The grill should be clean. You can rub the grill with oil to help create a non-stick surface. Better yet, most people instead prefer to lightly coat the fish itself with oil, butter, or mayonnaise before placing it on the grill. Fish will most likely stick to a cold grill. Completely preheating the grill for about 10 minutes before grilling fish on it will ensure that it won't stick. It will quickly sear and firm up on the outside, and become flaky and moist inside. How Hot Should The Temperature Be For Grilling Fish? That depends on the type and size of the fish. Larger fish such as stuffed whole fish wrapped in a heavy duty foil pack will need to be cooked slower, over lower heat. Smaller fish such as thin cuts and fillets cook more quickly, so a higher heat is better. A good way to test the hotness of the grill is by placing your hand over the heat and to count until it's too hot for you to keep your hand there. If you can hold your hand over it for a second or less then it's considered to be "very hot", 2-3 seconds is "hot", and 4-5 seconds is "moderately hot." Fish take very little time to cook so timing is crucial. You can very easily overcook it, which will draw out its moisture and become firm throughout. Figure about 8-10 minutes per 1 inch of thickness, or 4-5 minutes per ½ inch of thickness. You can try marinating fish to easily and quickly add some extra robust flavor before you cook it. Or you can also baste it while it cooks if you prefer to by lightly brushing on butter or a special blend basting sauce. Tossing some fresh herbs, such as thyme or rosemary, onto the grill also adds flavor and aroma. Another way to add flavor is with wood chips. Hickory, mesquite, almond and apple wood chips are just a few of the aromatic smoky flavors that are on the market today. After soaking them in water for at least half an hour, place them in an aluminum pouch with holes punctured in it to allow the smoke to escape. You can add half dry chips in with the wet ones. The dry chips starts the smoking process off first, and the wet chips will allow it to smoke longer. Turn the fish over only once after it is about halfway cooked. 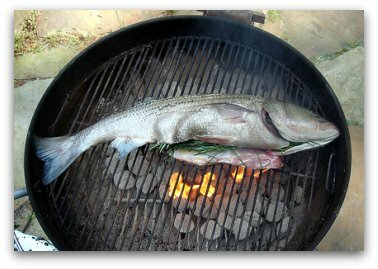 If the fish is directly on the grill, carefully use a long spatula to get underneath much of it as possible, and gently turn it over. If it's sticking then just wait for another 30 seconds to a minute to allow it to finish cooking on that side. It should then be a little easier to release from the grill. Cook the second side long enough for it to brown. Remove the fish from the grill about a minute or two before you think that it may be done, as it will continue cooking using the heat generated from within it. Some people may find it a bit easier to use a fish grill rack, such as this handy Charcoal Companion Triple Fish Grilling Basket . Skewering fish is a great party appetizer idea for barbecuing and grilling fish. They are simple, easy, fun, and usually go fairly quick. There are bamboo, wooden, and variations of metal skewers. It is recommended to soak the wooden skewers in water for at least half an hour before using them on the grill so that they don't burn. Allow the skewers to hang out over the side of the grill, or place a strip of foil underneath the sections of the skewers where you'll be handling them. This way they won't burn or feel hot to the touch. Planking fish is another technique used which creates a moist subtle flavor that is remarkable and not overpowering. This method can be used in the oven or on the grill. The fish is placed on a lightly oiled wooden plank, usually fresh aromatic types of cedar or almond wood. 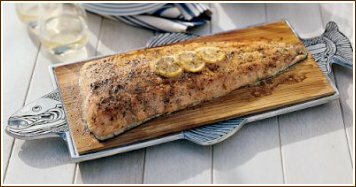 After preheating the grill to a very hot temperature, place the planked fish on the grill. Once the fish is about halfway cooked, turn the fish over and close the lid. Allow it to finish cooking this way until it's done and serve immediately. Happy Grilling and Cooking Fish!